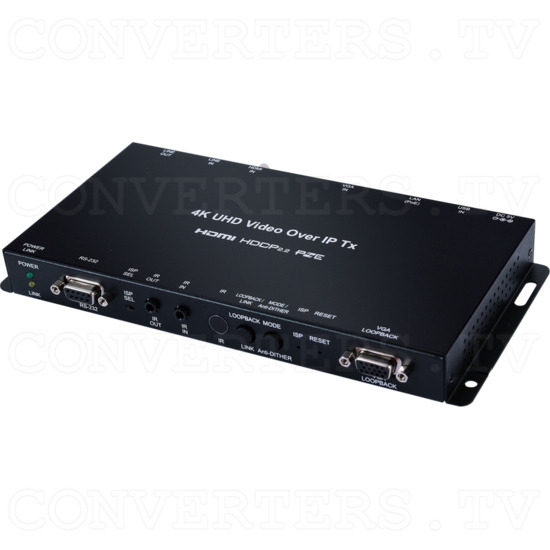 This 4K video and audio extender set is a multi-function video over IP extension solution with support for up to 4K UHD signal transmission. This transmitter and receiver pair is ideal for any household or commercial environment. The available input interfaces on the transmitter are HDMI (DVI compliant) and VGA. The receiver’s HDMI video output supports resolutions up to 4K@30Hz. A line-in port is also provided for additional audio support. Both video and audio are converted to, and transmitted as, streaming video via IP to a compatible receiver. The basic point to point transmission distance is 100m, however the distance can be extended further through the use of Gigabit network switches to reach across your local network offering the convenience of sharing your existing data network while extending the distribution distance. Additionally, it is possible for the user to cascade multiple units from the same device family to extend the transmission distance up to as long as needed without introducing additional signal loss or delay. This transmitter and receiver set also includes additional functionality such as RS-232 & IR pass-through, line-out and microphone input features that allow the user to enjoy interaction with, and control over, their favorite audio equipment from a distance. These units provide intuitive control options including physical external controls with an OSD as well as a comprehensive WebGUI. The available input interfaces on the transmitter are HDMI (DVI compliant) and VGA. The receiver’s HDMI video output supports resolutions up to 4K@30Hz. A line-in port is also provided for additional audio support. Both video and audio are converted to, and transmitted as, streaming video via IP to a compatible receiver. The basic point to point transmission distance is 100m, however the distance can be extended further through the use of Gigabit network switches to reach across your local network offering the convenience of sharing your existing data network while extending the distribution distance. Additionally, it is possible for the user to cascade multiple units from the same device family to extend the transmission distance up to as long as needed without introducing additional signal loss or delay. This transmitter and receiver set also includes additional functionality such as RS-232 & IR pass-through, line-out and microphone input features that allow the user to enjoy interaction with, and control over, their favorite audio equipment from a distance. These units provide intuitive control options including physical external controls with an OSD as well as a comprehensive WebGUI.